Earlier today, I was handed a battered copy of Brandenberg and ALIKI’s What Can You Make of It? This 1977 Greenwillow “Read-Alone” book tells the story of a family of mice. What the father mouse considers junk (empty egg cartons, juice cans, milk cartons, toilet paper tubes, spools, old magazines), other family members insist upon keeping. And so it takes extra moving vans to get all of their trash-or-treasures to their new house, upon which they fill the garage and — bonus! — now have a bunch of must-keep packing boxes. Long story short, the “rubbish” becomes the materials a crazy day of making. Spoiler alert: the family uses their new creations to put on a circus, complete with monkeys made of spools, oatmeal canister monkeys, and lots of boxes for stage decor. It’s a joyous book about the pleasures of using what we already have to create what we want, and then to pool those creations into something that brings community pleasure and enjoyment. It also epitomizes a belief about makerspaces that has crystallized for me during the past year, when I have found myself saying often, “I want our makerspace to be a place where all members of the family feel welcome.” (Hmmm … did I read What Can You Make of It? in 1977 and store up this idea all this time?) If someone had visited my family home in 1977, they would have seen a lot of this kind of making going on. Sound like fun? Two new books can help establish this idea of a family of makers, either at home or in a school, library, or community center setting. Mark Frauenfelder may be best known as a founder of Boing Boing and editor in chief of MAKE magazine, but kids may soon know him as the author of Maker Dad: Lunch Box Guitars, Antigravity Jars, and other Incredibly Cool Father-Daughter Projects, a collection of guided projects designed for a parent and child of any gender to do together. The projects are a bit difficult for a kid below the age of 9 to do independently, so they’re perfect for lazy Saturday afternoons spent pooling a parent’s skills with a kid’s ambition. But you could end up with a handmake rocking chair, a new skateboard, or a musical instrument. Families with children under 5 might prefer Rachel Doorley’s Tinkerlab: A Hands-On Guide for Little Inventors, based on the blog of the same name. Doorley, an art educator, has turned her family’s dining room into a studio for her two young children. Her book talks about great materials to have on hand, what to put within arm’s reach of a child (and what to do with your child instead), and art and science concepts that can be explored via “provocations” (interesting objects and materials left out) and household ingredients. While Maker Dad will guide families through the creation of projects designed by the author, Tinkerlab is more focused on creating space, culture, and climate for child-centered creating. Scattered throughout the book are interviews and influences from Doorley’s Palo Alto community, including interviews with staff from Stanford’s well-known Bing Preschool, its d.school (of which her husband is a leading figure), and excerpts from the work of renowned arts educator Eliot Eisner. If you’re a member of NetGalley’s digital galley service, Tinkerlab is still available for request! 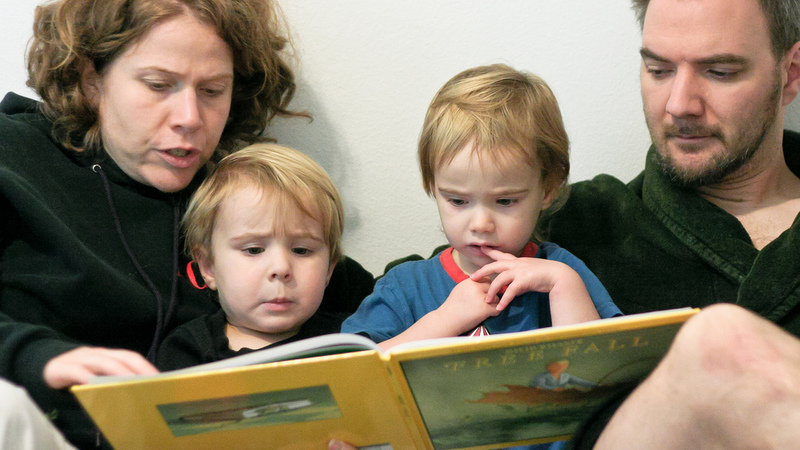 What other books have been influential in your family’s making?